This article involves climate change. Not global warming, but an extreme climate change nonetheless. From a location in the world where most people can only ride for half of the year due to the cold, to the tropical beaches of California, Gasser Customs has made the change from ice to nice. One thing hasn’t changed though, they are still turning out sweet rides. Last time we caught up with Gasser he was based in Ontario, Canada, but looking to move south. 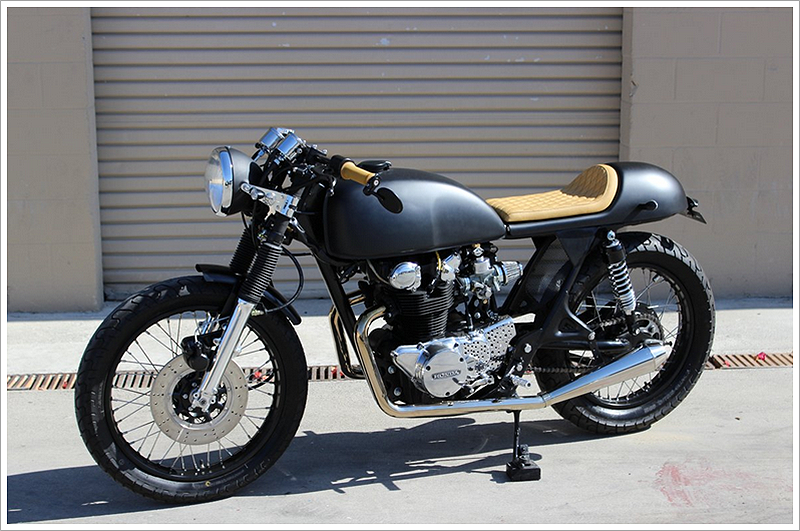 Six months down the track and the Canuck bike builder is mixing it up with all Cali has to offer in custom bikes, and adding his own style to the scene. ‘Blackjack’, the latest Gasser build started off with a simple idea, and built from there. The concept of twin overhead cams put visions of old school speed into Gasser’s head, and the build was started. 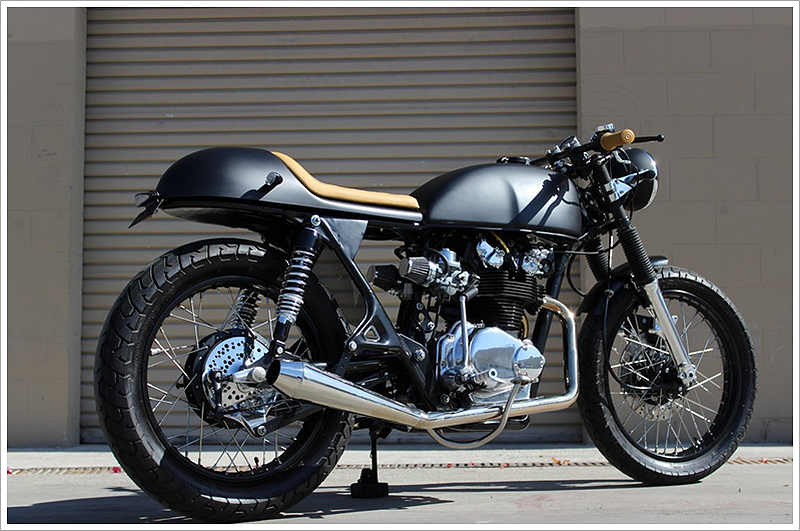 Taking a metallic purple Honda CB500T, the bike was stripped down completely, and no component left untouched. 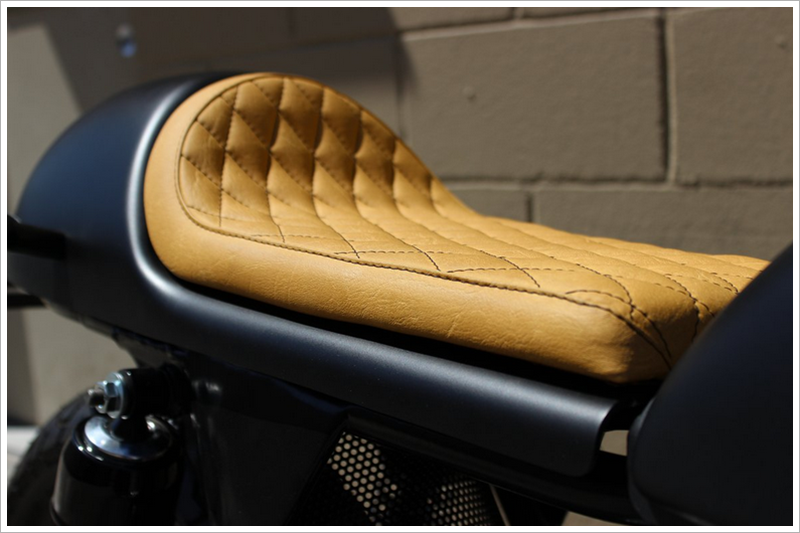 The bare frame was double powder coated, and a custom hoop fitted to suit the fibreglass seat made for this build. 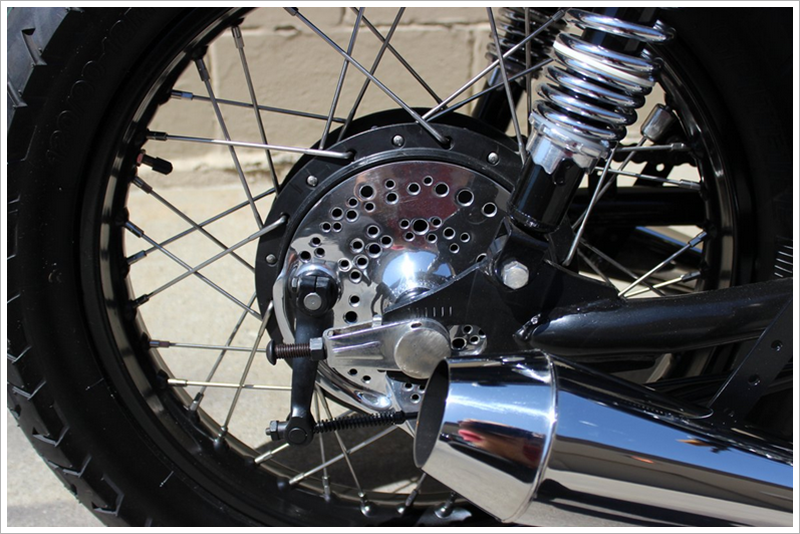 A perforated stainless inner fender helps to save weight, showing one of Gasser Custom’s signature build concepts, that of the art of the drill. 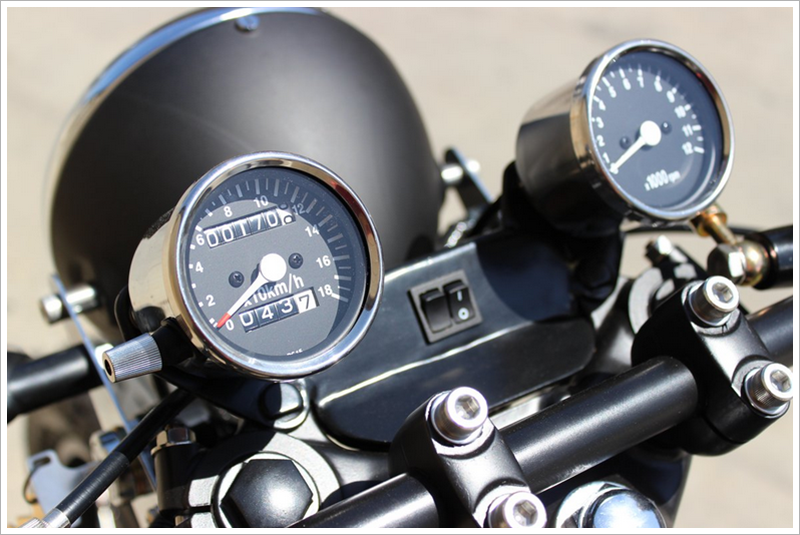 The fuel tank was epoxy lined during the build, and a custom gauge cluster fabricated to suit the flowing lines of the bike. Gasser’s trademark of polished highlights mixed with dark tones, is shown by mucho aluminium, offset by satin black paint. The powerplant has been treated to a full rebuild, with Gasser opting for oversized pistons on reassembly. 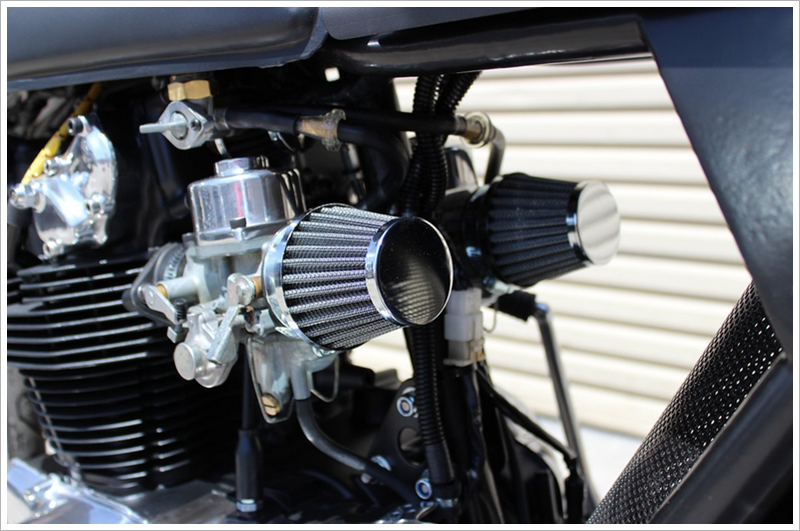 With the cylinder head has been planed, and the valves cut, this helped the builder achieve his goal of boosting the power of the bike. 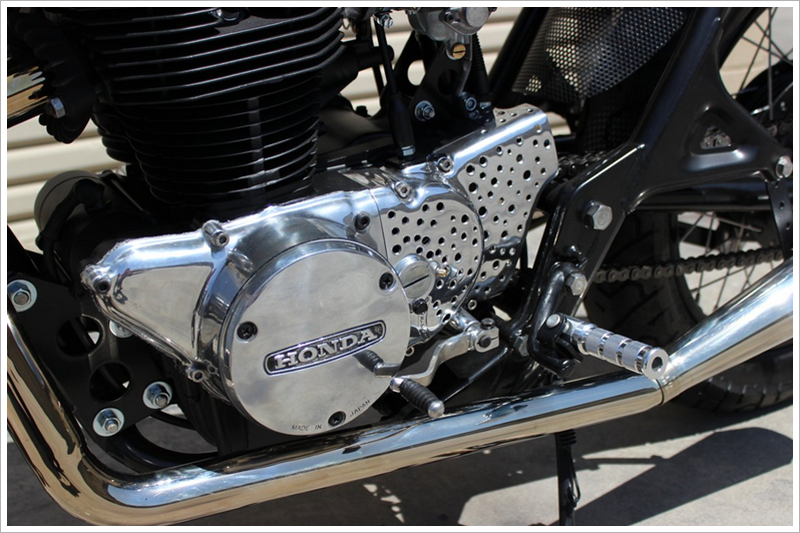 The carburettors have been stripped down and rebuilt, a fully custom 2 – 1 stainless exhaust culminating in a Thruxton silencer at the rear of this drilled out machine. Bridgestone Spitfire are the tire of choice for this bike, wrapped around the standard rims laced with Buchanan stainless spokes. A progressive suspension system sits at the rear of the bike, allowing for a mix of riding styles depending on the mood of the owner. The front rotor had been cross drilled, the calliper rebuilt and new brakes fitted front and rear. 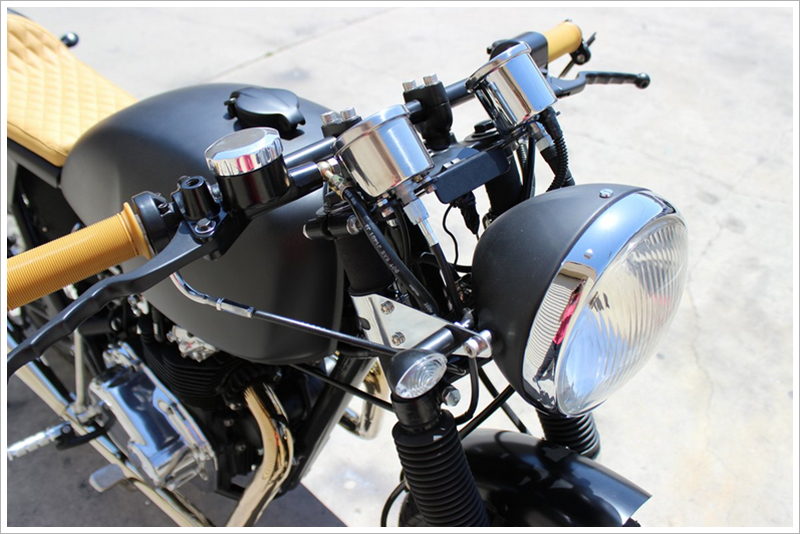 From the cold climate of Canada, to the sunny beaches of west coast America, Gasser Customs is showing it’s capability as a custom bike builder. Gasser’s build quality is right up there, with signature build concepts letting you know who customised the bike, and letting you know this bike isn’t just for show. ‘Blackjack’ is heading north to be with it’s new owner, who knows that with only 6 months of the year to ride, he is going to need something special to do it on.